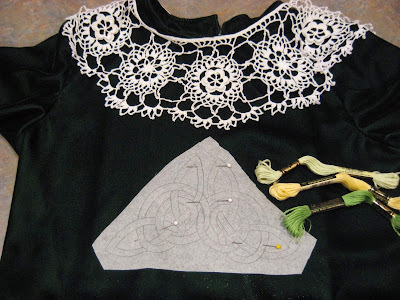 Hooked on Needles: Grace's First Irish Step Dancing Dress ~ Embroidering Again! Grace's First Irish Step Dancing Dress ~ Embroidering Again! It has been quite a few years since I've done any Irish Step Dancing dress embroidery, but I'm back at it now! This time it is only for my own daughter's dress as I no longer have the time to hire out my services. 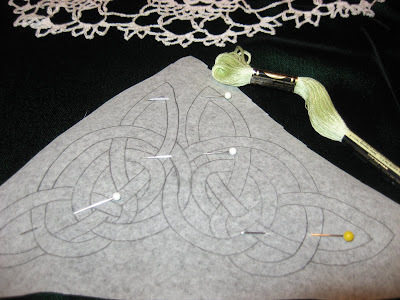 A few years ago here at Hooked On Needles, I shared all the steps I take, from beginning to end, to embroider these Celtic designs onto velvet using a hoop to maintain the tension on the fabric, but without hooping the velvet itself. If you are interested in learning my method for embroidering on velvet, click HERE and read through the post. Links to each step, with video or picture tutorials, are included for you to follow. I have laid out the tear-away stabilizer with design traced on it and centered it on the bodice of Grace's velvet dress. I had to un-pin the crocheted collar from her big sister Elizabeth's dress and lay it onto the neckline to make sure the embroidered design would not be placed too high on the bodice and get covered up by the collar. 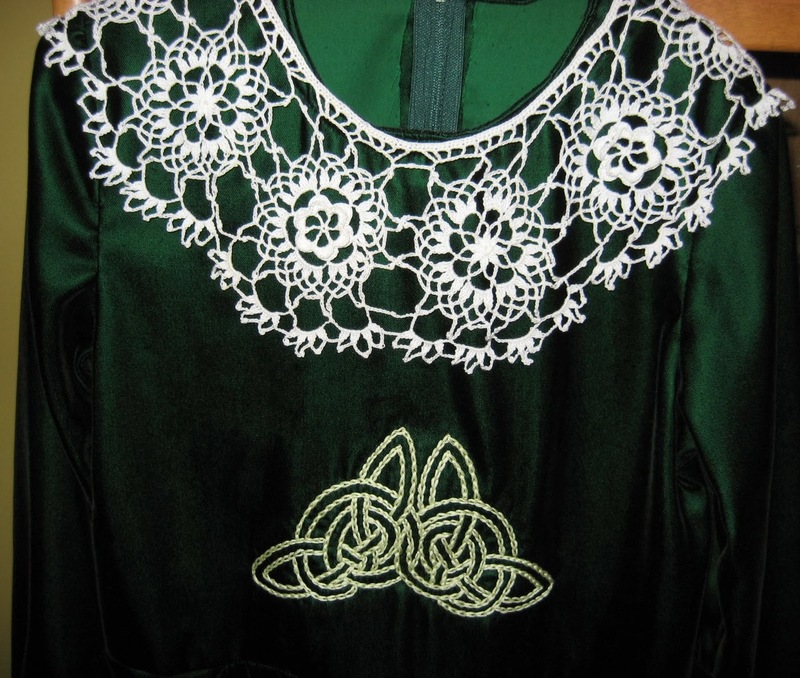 That Irish lace collar was also crocheted by me and I wrote briefly about it HERE and HERE. Grace will be using this collar for her dress now. The three skeins of embroidery floss are the colors that will be used for the designs that Grace gets on her dress this year. The lighter green is for the bodice design. The soft yellow will be for the big design on the front of the skirt, and the darker green will be for the pretzel designs along the hem of the dress. Here you can see that I have pinned the design onto the velvet. My secret for pinning onto the flat dress is to slide an acrylic cutting board inside the bodice of the dress so that I can pin the design onto the bodice without also pinning the back of the dress! Next I basted the design onto the velvet, and then basted the velvet onto a piece of heavier tear-away stabilizer that I had already put into a spring hoop. This is shown in my step-by-step tutorial to which I referred at the top of this post, and which can be found HERE. This is the completed design. 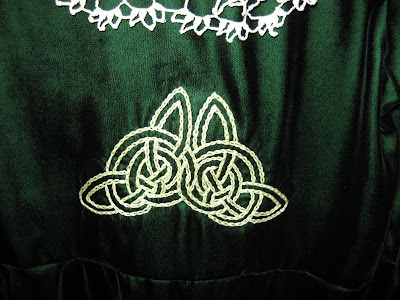 I think the soft green embroidery floss used in this design is such a nice contrast to the emerald green velvet and really makes it stand out. ...and an even closer look! This design may appear to be lopsided on the dress, but in fact it is the way it is meant to be. The design itself is just a tad lopsided and no amount of measuring, straightening, or adjusting can make it look different! Believe me, I've tried! I have probably embroidered this design onto a dozen dresses over the years, and have tried and tried to make it look straight, but with no success. After much frustration, I decided to do some measurements to see if maybe it was the design, and not the way I was stitching it, that gave it this lopsided appearance. Much to my relief, I discovered that it is indeed the design itself and that's just the way it is! That is as far as I have gotten on this project, and will be putting it on hold until after the talent show at school next week. Grace wants to do a little step dancing for the show and wants to wear her new velvet dress. I know I won't be able to finish the next larger design in time for the show, so I will leave it as is for now and continue embroidering on it after the show. She is very excited to be able to wear it for the talent show. For those of you interested in my educational adventure that I began in the fall of 2012, I have begun my fourth semester at my local college just this week. This semester I am taking three courses: Health and Wellness, Art 101, and Statistics. Besides the two class sessions for Health and Wellness, I also will be spending at least an hour in the fitness center at the college each week. I'm actually looking forward to the opportunity to move a little more! Also one night a week for two and a half hours, I will be learning how to paint in oil. I am very excited about that course, which is my humanities elective. And then there's statistics. What can I say about that? I need it if I want to get my BSN, so I'm taking it! Wish me luck! 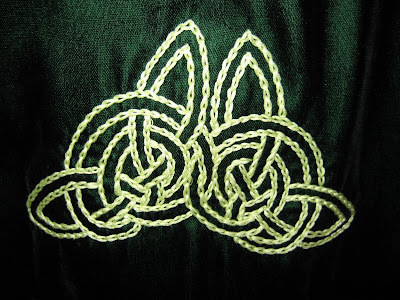 Wow I love the Irish embroidery. Good luck on you new classes - I know you will be a star student!! Caramel Corn Puffs ~ No Needlework Necessary! Merry Christmas and a Crocheted Christmas Afghan! Nana and Me ~ Christmas is Coming!